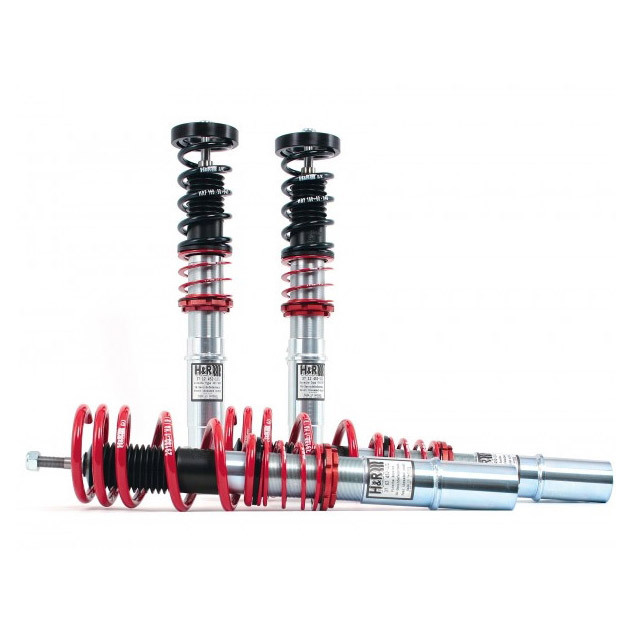 H&R Twin Tube Street Performance Coilovers are the suspension solution for discerning drivers, from daily drivers to serious tuners; anyone can appreciate the awesome handling and superb ride comfort. H&R is the originator of the true coilover system for the street. Each custom valved shock is tuned with a precision-engineered progressive rate spring to create a finely tuned suspension system. The fully threaded shock body allows for adjustable vehicle lowering—to where you want. This feature helps balance vehicle weight, resulting in a lower centre of gravity and improved performance and control. Lowers by 25mm-60mm on average. The H&R Twin-Tube range of coilovers is one of our biggest selling brands. This superb range of height adjustable suspension offers a superb ride and massive ride height adjustment. Each kit will lower a maximum of just over 60mm. The damping is up-rated by 30% offering a firm yet comfortable ride. The H&R/Koni dampers use a special twin tube gas pressurised damper using upside down technology for increased levels of performance and grip. The H&R damper basically gets harder as the force increases, reducing body roll and still maintaining a silky smooth ride quality. The H&R Twin-Tube coilovers feature full height adjustment from 25mm-60mm. The body of the coilover is made from high grade stainless steel. Each H&R coilover is fitted with a built in bump stop and helper spring which ensures the main spring stays in place when the car is jacked up. The stainless steel bodies ensure excellent weather protection but bear in mind all coilovers should be kept well greased to prevent dirt build up between the coilover threads. The H&R Twin-Tube coilover brand is well known all over the world for build quality, value for money and perfect road holding and balance. If you are looking for a coilover suspension kit combined with un-rivalled levels of performance at a truly superb price…H&R is the one to choose! Fixed rate 30% up-rated sports damping valve for comfort, ideal for fast road use.